My first attempt at surfing in California turned out to be a multi-tasking adventure in which I simultaneously tried to avoid throwing up saltwater, losing my bathing suit and drowning. A few months after my return to New Orleans, City Surf Fitness, a boutique studio that started in Dallas, opened on Magazine Street. I felt compelled to get back on the board from the safety of dry land, partially because I wanted to switch up my workout routine and also because I vowed to myself that my next surfing adventure would be more successful. In New Orleans, City Surf offers six classes: City Surf, Beach Body Bootcamp and City Surf Circuits, which are cardio-based and designed to make you sweat, while the Big Kahuna focuses on strength-training, using resistance bands and a 10-pound sand bell. Then there’s Buddha Board, which is yoga-inspired; and Pipeline, which focuses on toning and small-ballet-inspired movements. 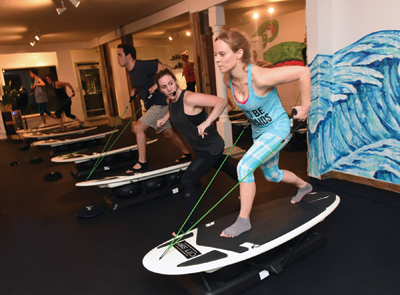 My coworkers and I took the signature City Surf class, and while we wobbled on the boards a little bit at first, by the second go-around, we felt much more stable and strong. Information, 5924 Magazine St., 281-4174, CitySurfFitness.com.